A good gaming headset can really make the gaming experience better than ever before! All gaming enthusiasts understand the need for a quality gaming headset and are always on the lookout for something better. The HyperX Cloud II is the all-new gaming headset that promises a better gaming experience. It is packed with numerous features that make it a tough competition to other popular gaming headsets available in the market. 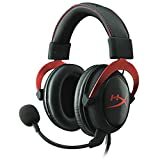 If you are planning to buy a new gaming headset you might want to consider the HyperX. Let’s take a look at what the HyperX has in store for passionate gamers. The headphones are rated for as low as 15Hz; this is especially important for gaming because it helps you feel like you’re in the game’s world – a completely immersive experience. These headphones can also handle frequencies up to 25khz. You can expect the mic to pick up sounds as low as 50Hz and as high as 18kHz. That’s the largest response range of any headset available in the market at this price range. This means that the microphone effectively captures and transmits your voice. The HyperX has 53 mm drivers and this is partly what allows the HyperX’s headphones to reproduce extreme highs and lows with excellent fidelity. The HyperX is made up of plastic and aluminum, with leather for the headband and the ear cups. Overall, the construction quality is excellent, and you can expect this gaming headset to last for a long time. The HyperX produces similar audio quality and comfort levels to the PC 363D and the Razer Kraken, which are both very well established gaming headsets in the market, and are the top tier when it comes to sound. With strong audio specs, a solid design and excellent support options, this gaming headset definitely a level up. Presently, this is the best budget headset. The affordable price is probably one of the greatest attractive points to this gaming headset. It’s extremely portable too! So if you have been looking for a new gaming headset that does not burn a hole in the pocket and also offers quality features and an immersive gaming experience, the HyperX is definitely a great option! Overall this headset is one of the top tier headsets in the market. It can outperform some of the other leading brands, and provides an exceptional cool looking design to the headset. The performance is outstanding, and the sound quality can only be described as amazing.